Overall, Washington earned a C grade on Education Week’s Quality Counts survey and finished 20th, with a score of 75 out of 100 possible points. In an annual survey of each state’s public-education system, Washington ranked near the bottom when it came to narrowing the gap in performance between low-income students and their wealthier classmates. Washington ranked second to last in that category in the Quality Counts ratings, produced by Education Week, a national news outlet. The District of Columbia placed last. Yet Washington ranked 13th in overall K-12 achievement. That indicator combines the numbers from 18 different measures like graduation rates, reading and math performance and Advanced Placement test scores. Overall, Washington earned a C in the survey, with the 20th-highest score of 75 out of 100 possible points. That’s slightly higher than last year, when the state was ranked 22nd. Overall, the analysis looked at three main indicators: “chance for success,” school finance and K-12 achievement. Massachusetts ranked first for the third year in a row. 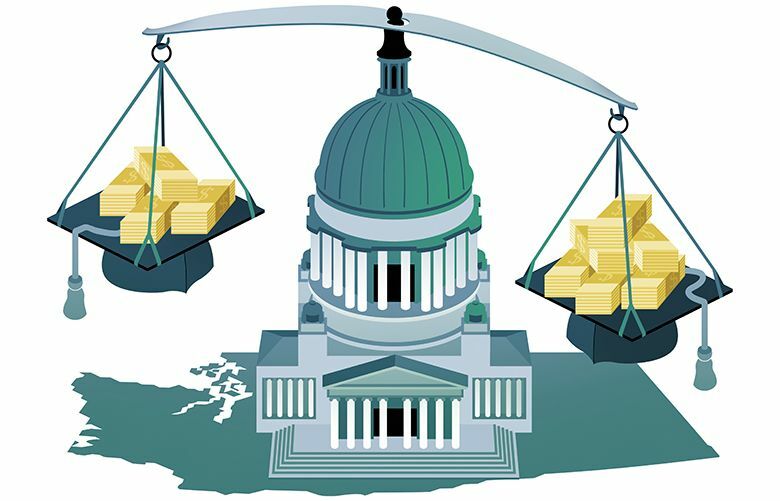 Though Washington and Massachusetts’ student populations are comparable, a Seattle Times Education Lab story found that the two states approach funding in very different ways. Oregon and California both received a C- grade and ranked 40th and 42nd. Idaho ranked fourth from the bottom with a D+ grade.